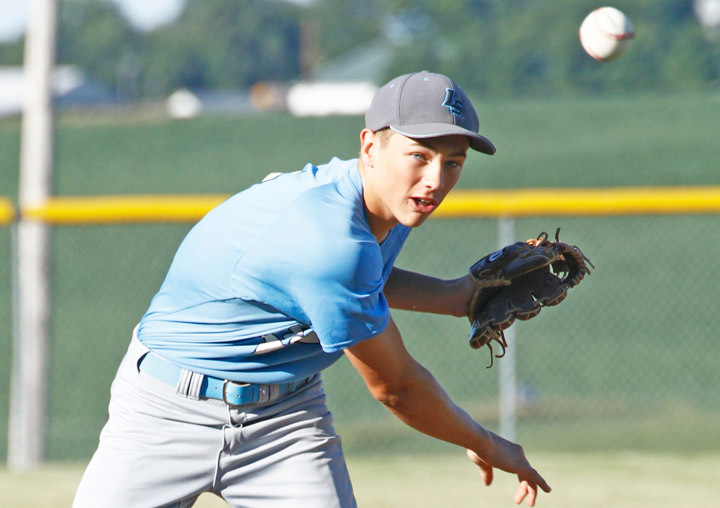 With just three games left in the regular season, the Lynnville-Sully baseball team is looking to finish strong. The boys have been playing solid ball and are on a six-game winning streak after beating three conference teams in the past week. Senior Isaac Collins fires off a pitch during senior night against North Mahaska last Friday. 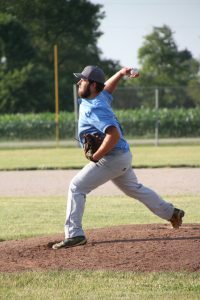 The Hawks voyaged to Montezuma last Wednesday, June 21, and left early after beating the Braves in five innings, 13-0. The Hawks hopped on Montezuma right away, scoring two in the first and five in the second. They proceeded to bring six home in the fourth. L-S shut out Montezuma, allowing no runs in their second win over the Braves this season. The Hawks hit .481 for the night, going 13-27. Senior Caden Dunsbergen stepped up to the plate and hammered out a home run during the first at bat for the game. Along with this home run, he had two RBIs and one stolen base. His brother, junior Carson Dunsbergen, went three-for-four, crossing the plate twice and bringing in three RBIs. Junior Elijah Collins got on base all four at bats, getting walked twice and pounding out two doubles. E. Collins also brought in two RBIs, stole two bases, and scored twice for the Hawks. Senior Isaac Collins pitched 4-1/3 innings. He gave up two hits all night and struck nine out. His brother, E. Collins, closed the remaining two-thirds of an inning for him, striking one out. The Hawks’ game against BCLUW at Conrad was cancelled due to rain on Thursday, June 22. Back in action on Friday, L-S played a good game for the night of Pack the Stands against the North Mahaska Warhawks. After seven hard-fought innings, the Hawks came away with a 10-3 win. The Hawks slowly collected their 10 runs throughout the game, earning one in the first, four in the third, three in the fifth, and two in the sixth. North Mahaska resisted, scoring one in the third and two in the sixth. “[It was a] good way to end the week with a big win over North Mahaska,” voiced L-S Coach Bob Scandridge. L-S had a collective nine hits throughout the night. “We have been getting key hits when we needed them,” commented Scandridge on their offense. Sophomore Rylan James was one-for-two with a double and a stolen base. Both E. Collins and senior Tyler Van Zante had two stolen bases for the night. Altogether, the Hawks took six bases. Collins started the night pitching and is credited with the win after pitching 5-2/3 innings. He gave up seven hits and struck out a solid six. “Elijah Collins pitched a good ball game by limiting walks and throwing strikes,” noted Scandridge. Van Zante came in to pitch one-third of an inning, and junior Josh Dunsbergen finished the final inning. The night also served as senior night for I. Collins, Caden D., and Van Zante. The Hawks came away with another conference win on Monday, June 26, against the BGM Bears. The final score was 8-1. The L-S boys had an explosive first inning, bringing in an impressive six runs. They didn’t stop at six, scoring two in the fifth. BGM got their first and only run in the top of the seventh. L-S had eight hits to match their eight runs. Junior Corbin James was one-for-three, hitting the Hawks’ only double for the night. Caden D. went two-for-three, stealing one base, bringing in two RBIs, and scoring twice himself. Van Zante was given the win, pitching six innings. He gave up only one hit, walked two, and threw an admirable 10 strikeouts. J. Dunsbergen closed down the game for him, striking out one. The L-S boys (14-5) will be at HLV on Wednesday, June 28. It’s an important game in the SICL as a win by the Hawks would for sure secure them a share of the conference title. The Hawks would also be guaranteed part of the title if Colfax-Mingo lost to BGM on Tuesday, June 27. L-S will also face E-B-F next Monday, July 3, and PCM on Wednesday, July 5. See next week’s paper to learn how the Hawks fared. “We are looking forward to the challenges that are in front of us next week, with the last two conference games. We are playing loose and confident at the right time of the year,” Scandridge said.